Today Freedom Scientific today announced the release of JAWS® for Windows version 13, including Convenient OCR. 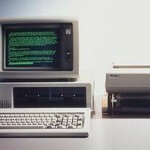 By performing Optical Character Recognition on text that is displayed in a graphic, blind computer users are now able to access such things as scanned-in posters and other such graphical images that might as well have been a blank page before. JAWS can even allow finding and clicking on control links and buttons that were once hidden, even, believe it or not, the menu of a DVD! NASA has released historic sound bites that can be used for ring tones or computer messages. Even the most mildly geeky among us must kvell at least a little at the thought. Imagine the delicate beeps of Sputnik gracing your ringer, or Neil Armstrong’s timeless “One small step for man….” The sound clips come in three formats, Android, iPhone and MP3. Personally, we find ourselves torn between the shuttle launch, the spooky Saturn emissions (apropos for Halloween!) and Astronaut Cooper’s comment, “It’s a new and strange environment, first, suddenly finding yourself in orbit.” We know the feeling, Coop! LookTel has released version 2.0 of the Money Reader. The Money Reader is a mobile application for the iPhone that identifies currency and speaks the denomination. Currency is recognized instantly and there is no need to worry about holding the camera still or waiting for a photo capture. The Money Reader recognizes currency in real time and no Internet connection is required. The new version of The Money Reader recognizes several currencies including US Dollar, British Pound, Canadian Dollar, Australian Dollar, and the Euro. LookTel Money Reader provides Voice Over support for several languages including English, Spanish, French, Italian, German, Polish, Russian, Korean, Finnish, Danish, Swedish, Norwegian, and Japanese. A tone only mode is also available for added privacy. The LookTel Money Reader is available now in the Apple App Store. Read2Go is Bookshare’s new accessible e-book reader app for the Apple iPhone, Ipad, and iPod. The app makes it easy to locate, download, and read books from Bookshare from within a single program. There is no need to download your books to a computer to unzip them and transfer to your mobile device. Read2Go takes care of all the work for you. Read books using Apple’s VoiceOver navigation and built in voices. Words are highlighted as they are read. Read books with Braille using a Bluetooth display. We applaud Bookshare for developing Read2Go for their members. It is very well designed and simple to use. Any Bookshare member with an iOS device will be downloading and reading books in no time using Read2Go. 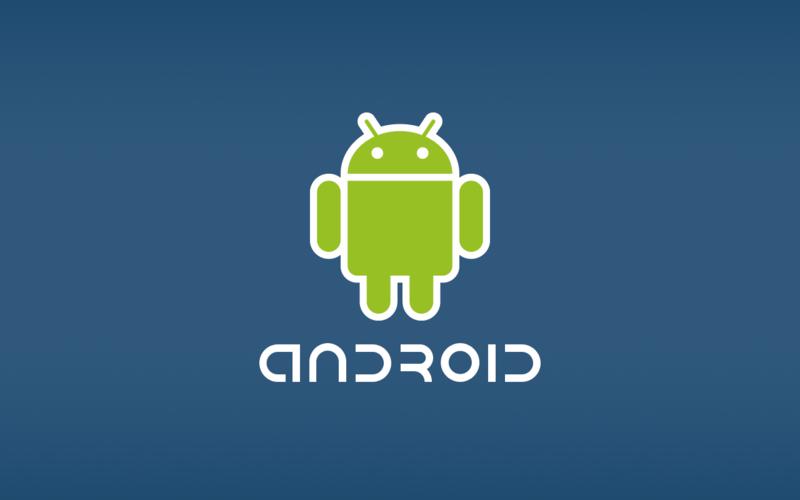 Although we usually like free apps the best, we think Read2Go is worth the price for the convenience and ease of use. 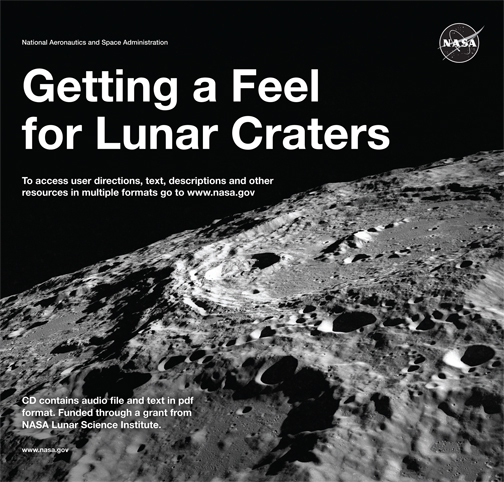 “Getting a Feel for Lunar Craters” is a new book from NASA designed to educate blind and visually impaired people about the Moon’s surface using tactile diagrams. David Hurd, a space science professor at Edinboro University of Pennsylvania, created the book along with tactile engineer John Matelock after a visually impaired student enrolled in Hurd’s introductory Astronomy course. 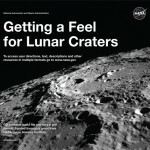 “Getting a Feel for Lunar Craters” is an excellent educational tool and we give it a strong BlindGadget 5 Robots rating. It would have been great to have had access to a copy when we took on Astronomy 1014 a few semesters ago. The tactile edition is available from the NASA Lunar Science Institute and there are also text and audio editions available for download. The “Virtual Eye” is a GPS navigation system developed by B. Amutha as part of her PhD research of SRM of India. The device is intended for blind and visually impaired children and provides simple voice guidance navigation. It is belt mounted and also reportedly uses sonar for detecting obstacles and GPRS for location tracking. Amutha is currently seeking government support to begin production. 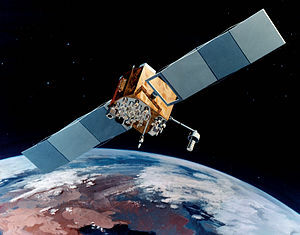 Although we found the concept of tracking blind children with GPRS to be a bit alarming, combining GPS navigation with sonar and GPRS is an interesting innovation. Once you steel yourself against the attitudes that frame the original article, you can read more about the “Virtual Eye” in The Times of India. Sendero Group has announced a special pricing program for individuals who purchase their GPS package for the BrailleNote or BrailleSense notetakers through the end of the year. Sendero recognizes that the relatively small market for blindness products tends to keep prices high and often out of reach for individual consumers. 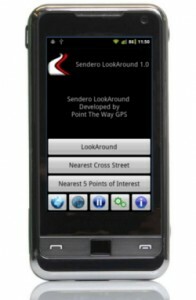 Through the end of 2011, Sendero will be pricing the GPS software on a sliding scale, depending on how many orders are received. The maximum price, for a package that normally sells for as much as $1598, will be $888, with the potential of being as low as $428. It is great to see companies like Sendero offer pricing for individual consumers, since many of us do not have the same resources as schools and agencies. Read more about the GPSathon at the Sendero Group website. Andrew Phillips, National Association of the Deaf; Eric Bridges, American Council of the Blind; Mark Richert, American Foundation for the Blind; and Jenifer Simpson, American Association of People with Disabilities, outside the FCC building, Washington DC, after meetings on pending rules under 21st CVAA. The Federal Communications Commission voted today to restore the television video description regulations that were passed as part of the Twenty-First Century Communications and Video Accessibility Act of 2010. 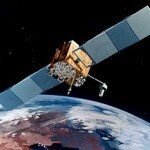 The effective date of the order, which passed the commission 4-0, is July 1, 2012. The following summary of the regulations was prepared by the Coalition of Organizations for Accessible Technology, which was instrumental to the passage of the new rules. •Video description is defined as the narrated descriptions of a television program’s key visual elements inserted into natural pauses in the program’s dialogue. •Video descriptions improve access to television programs for millions of Americans who are blind or visually impaired. •The video description rules require ABC, CBS, Fox, and NBC affiliates in the top 25 market areas and cable and satellite television providers with more than 50,000 subscribers to provide video description. •ABC, CBS, Fox, NBC, USA, the Disney Channel, TNT, Nickelodeon, and TBS are each required to provide 50 hours of video-described prime time or children’s programming per calendar quarter. •Full compliance with the rules is required on July 1, 2012. The complete report and order along with other related documents and statements are available on the COAT website. 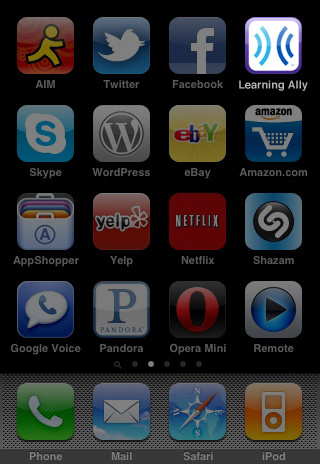 Learning Ally (JAWS still does not say it correctly) has released a new version of their audio bookreader for Apple iOS. The upgrade allows the user to play DAISY-formatted audiobooks from the Learning Ally library on such portable Apple tech as the iPhone, the iPad and the iPod Touch. The app is available through iTunes for $19.99. According to the FAQ, no re-authentication is needed for Learning Ally members already using the earlier version known as RFB&D. Play while locked. The new version can continue playback after the Apple device locks and turns off the screen to save battery life. This function can be turned on or off through the iOS “Settings” app. Open with last book played at last point played. The new version resumes reading where users left off the last time that they ran the app. This feature can be turned on or off through the iOS “Settings” app. Remember speed control and other settings. When these settings are changed, they will be remembered across all books and sessions. The American Council of the Blind and Google are conducting a survey to gather information about computer Usage and Assistive Technology by blind and visually impaired persons. The survey can be completed on the web or by phone and will be used to better understand how blind users interact with the web. Survey respondents will be asked to describe which assistive technology tools they use to access the web and how they make decisions to change or upgrade these tools. The survey is available now and will run through the middle of September. 6dot Innovations is launching a new, battery-powered, portable Braille labeler which can quickly print out Braille labels. The labels are well suited for prescription bottles, microwave touchpads, canned foods, and just about anything else that needs a label. 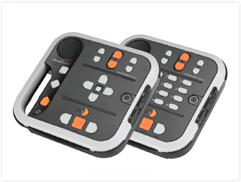 6dot founder and chief executive Karina Pikhart said that, while there are a number of other Braille labelers on the market, they tend to be too big and bulky to take along to the pharmacy for example. 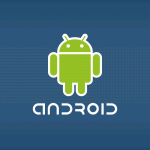 The company is based in Palo Alto, California. They have already sold out their first production run of the electro-mechanical labeler which embosses small adhesive labels that stick to just about anything, Pikhart said. She said 6dot is seeking to target the 37 million people worldwide who are blind and will expand to serve the 650 million people around the world with disabilities. The battery-powered labeler can be an important tool for helping blind people be independent in their everyday lives, Pikhart said. 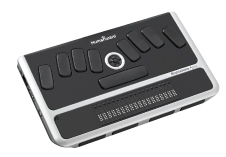 You can connect a standard keyboard to the device so that people who are not Braille literate, such as parents and teachers, can also create labels. Pikhart, a first-time entrepreneur, started working on the idea at the Massachusetts Institute of Technology in a product design class in the fall of 2008. She and two other co-founders, Trevor Shannon and Robert Liebert, developed the original prototypes. They won several contests, including the MIT Ideas Award, the ASNE Mechanical Innovation Showcase, and Stanford University’s product showcase. 6dot is currently raising funds through a Kickstarter campaign. 6dot has received design consultation from the Perkins School and Michael May of Sendero Group. They expect the labeler to sell for about $200 and to begin shipping in the next several weeks. Darren Burton and John Lilly, of the American Foundation for the Blind tech lab, pit the free and open source NVDA screen reader against the free Thunder screen reader in a series of computer tasks. They evaluated the two screen readers on several different computers equipped with Windows XP and Windows 7. 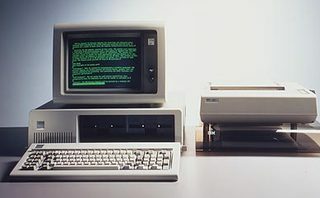 The tests included productivity applications such as Microsoft Word and Excel, and online activities like banking, shopping, and using iTunes. NVDA proved to be the overall winner in the tests and was judged to be a close competitor to the commercially available screen readers. You can read the complete results in their detailed report in the August edition of Access World. RoboBraille is an email and web based service for converting documents into any one of a large number of accessible formats. It is easy to convert a plain text document into Braille, ePub, or audio formats. You can also convert between other formats such as rich text format word (both .doc and .docx), Excel, and PDF. And, just about any image format like JPG, BMP, PCX, TIF, and PDF can be converted into text. Tools are provided for splitting files and changing the character set of a file. RoboBraille supports fifteen different languages and is free for non-commercial use. This is the best file converter we have seen. It is very flexible and produces high quality results (although it did not make much sense of our cell bill).